Customer lists define a segment of your users based on a set of criteria. Customer lists are similar to views for tickets in that they enable you to create a list based on system attributes, tags, and custom fields. In this case, the list is a group of users instead of a group of tickets. 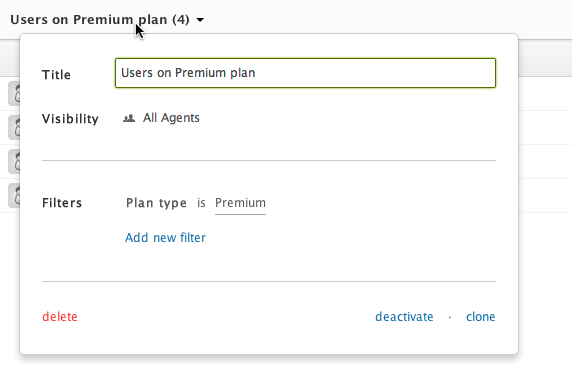 Entitlements Create separate customer lists for each plan type you offer, based on a custom field for subscription type or plan. Online retailers Create lists of customers according to their purchase history or preferences, based on custom fields. E-Commerce Create a list of customers based on their subscription start date or trial expiration date. Gaming companies Create customer lists to identify big spenders and active gamers, based on the customer's online activity. You can do more analysis by exporting customer lists as CSV files. Or you can install apps to send emails campaigns or surveys to a customer list. Customer lists are available as a Professional or Enterprise Add-on. Administrators can create shared and personal customer lists. Agents can create only personal customer lists. Enterprise agents might also be able to create shared lists, depending on their custom role. Note: Customer lists is part of an Add-on that also includes NPS surveys. For information about reordering, deactivating, and deleting customer lists, see Managing your customer lists. You create a customer list by applying filters to determine which customers are included in the list. Administrators can create shared customer lists (available to all agents or available to one group) or they can create personal lists (available only to themselves). Agents can create only personal lists for their own use. 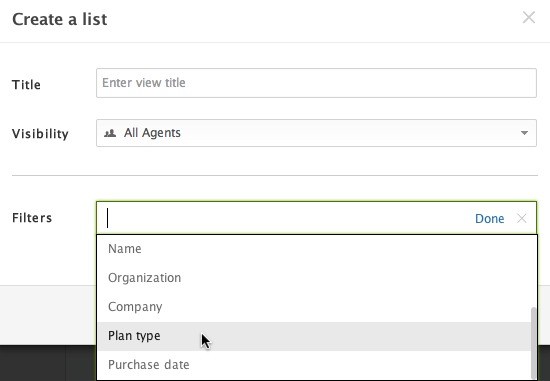 Note: Enterprise agents might also be able to create shared lists, depending on their custom role. For information about permissions for Enterprise accounts, see Custom agent roles. Tip: Be sure to check out our Customer-centric cookbook for recipes using customer lists. Click the Customer Lists icon ( ) in the sidebar. Click Customer Lists in the top toolbar, then select Create a list. Enter a Title for your list. (Admins and Enterprise agents with permission to create shared customer lists) Select a Visibility option to determine who can see this list. All agents This list is available to all agents. Me only This list is only available to the admin or agent who creates the list. Group This list is available to the selected group. You can select one group only. Agents do not set a visibility option because they can create only personal lists for themselves. They cannot create shared lists. Click in the box beside Filters, then select a condition, an operator, and a value to define this collection of users. Conditions include system attributes, tags, and custom user fields. For more information about filters, see Building condition statements for customer list filters. If you want to add another filter, click Add new filter. Click Save to create the list or click Preview to see the list before you create it. You can also click Cancel if you don't want to create the list. If you clicked Preview, click Save or Cancel in the upper-right corner of the list preview to either create or cancel the list. Note: If you have more than 100,000 total users you will not see a complete list of matched users in your customer lists. Instead, you will see a sample of users that match the customer list. Admins can export a customer list of up to 100,000 users in size by selecting Export as CSV to see the entire list in the message that appears in sampled lists. The conditions for customer list filters include the system attributes, tags, and custom user fields. The operators and condition values vary depending on the selected condition. Language The user's language preference. Role The user's role (for example, end-user, agent, a custom role, and so on). Created The date the user was added. Last login The date the user last logged in. Custom user fields Custom user fields that have been created. You can access all of your customer lists, both shared and personal lists, in one place. Click the Customer Lists icon ( ) in the sidebar, then select a customer list. 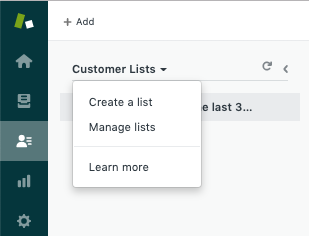 In the left pane you see your customer lists, with shared lists first and personal lists below that in the Your lists section. In the right pane you see the selected customer list. After you create a customer list, you can edit the title, who it's available to (all agents, a specific group, or just you), and the filters that define the customer list. If you want to change the way information is presented in the customer list, including the user information that appears in columns, the sorting, or the grouping of customers, see Modifying the columns in a customer list. At the top of the customer list, click the name of the list. Make changes as necessary to the Title, Visibility, or Filters for the list. Note: Only administrators and Enterprise agents with permission to create shared customer lists can change visibility. Your list automatically updates as you make changes, but your changes are not saved yet. Click Save at the top-right side of the customer list to save your changes. Alternatively, click Cancel if you don't want to save your changes. After you set up a customer list, you can modify the information that appears in the list for each user. You can also change the way the information is presented, including the sorting and grouping of users. If you want to edit the customer list, including the title, visibility, and filters, see Editing a customer list. Click the List controls icon ( ) on the right side of the column headers row. If you want to remove a column, hover your mouse over the name of the column, then click the X. You can remove multiple columns. Your list updates as you remove columns, but the changes are not saved yet. 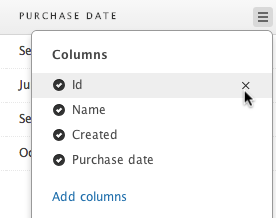 If you want to add a column, click Add columns, then select the names of the columns you want to add. You can select multiple columns. Your list updates as you add columns, but the changes are not saved yet. Open a customer list, then click the List controls icon ( ) on the right side of the column headers row. Click the Group by drop-down list, then select customer information you'd like to use to group customers in the list. Your list automatically updates, but your changes are not saved yet. Click Save at the top-right side of the customer list to save your grouping. Click the Order by drop-down list, then select customer information you'd like to use to order your list. If you want to reverse the sorting, click Sort above the drop-down list. Click Save at the top-right side of the customer list to save your ordering. Administrators can export customer lists as CSV files. As with all data export in Zendesk Support, this option is limited to admins. When you request a file, you will be notified via email when it's ready. You can download a zip file containing the CSV file. The download link is valid for at least three days. Click the Customer Lists icon ( ) in the sidebar, then select the customer list you'd like to export. 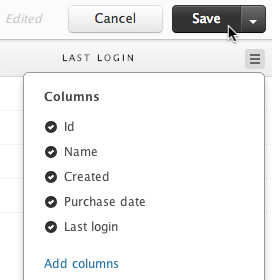 Make sure your customer list includes all the columns that you want to export. To add or remove columns, see Modifying the columns in a customer list. Click Export as CSV in the upper-right corner of the customer list. You are notified via email when the file is ready. Click the link in your email notification to download the zip file containing your CSV file. The download link is valid for at least 3 days. Mailchimp Campaign enables you to send email campaigns to a targeted customer list and proactively communicate or follow up with your customers. SurveyMonkey enables you to send surveys to a targeted customer list to gather valuable feedback and ideas for your team and business. Admins can install apps in Zendesk Support. Agents can use the apps to create email campaigns or surveys for customers in a customer list. Click the Admin icon ( ) in the sidebar, then select Apps > Browse. Find the MailChimp Campaign app or the SurveyMonkey Create app, then click the title of the app. On the app page, click Install app in the upper-right corner. Click the icon in the sidebar for the MailChimp Campaign app or the SurveyMonkey Create app. Enter a name for your email campaign or survey. Select an existing customer list or click Add a new customer list to create a new list. Complete the other information for your campaign or survey. Complete and send the email campaign or survey in MailChimp or SurveyMonkey. Is it possible that I can create a customer list by uploading a file? Due to having a huge customer base, our customers are only created in Zendesk if they contact us. On a monthly basis I have a very specific base of customers that I need to contact, as such the majority of them won´t exist in ZD. It would be awesome if I can upload a file to create the customer list, but from what I have seen, it doesn´t look possible. Luis, thanks for the feedback -- we don't support this today. The best workaround is to upload your list of users with a specific tag, and use that tag to create your customer list. It would be great if we could use a customer list as a target for macros. Every year we ask our users if they want to subscribe on service X for X year(s) longer. You may want to check out the 'Proactive TIckets' app. An Administrator can install this from the Zendesk Labs part of the Marketplace. You start with a customer list and send each customer a new ticket. Sounds like what you are after. The Proactive Tickets app was written by Zendesk but is not supported, so please read the disclaimer. Kalle, can you share with me how often you send a proactive outreach like this? Is it timed based on the customer's subscription date? I haven't sent out any yet but I will use the customer lists for our adobe creative cloud, MS Project and MS Visio users whom are subscribing to those applications on a yearly basis. We'll send them a "respond to cancel your subscription" message, manually (for now). Since we funneling all hardware and software orders into Zendesk , these kind of "directed" mass messages are a real time saver. Thanks Kalle. "We receive system status messages daily from a bunch of systems" -- where are those going right now? Into Zendesk? Or into a different system? Customer list icon does not appear in the sidebar. I am admin on a Zendesk area converted from Trial to Professional. Customer lists are an add-on feature for Professional and Enterprise accounts, so you'll need to contact your Account Manager to get that added to your account. If you don't know who your Account Manager is, you can contact Zendesk Support and they'll get you pointed in the right direction! As some others mentioned, having this for organizations would be very helpful. For my company, having a simple list of orgs created in the last 30 days would be very helpful. Are there any plans to include this in a future release? Thank you. I don't have this add-on yet, but from what I have seen, it still does not support Organization lists. Is this true? This seems to have been a heavily requested feature for over 3 years now. Dan, that is true, customer lists currently only builds User lists. Using the Zendesk API, you could create Organization lists of your own, but you'd need developer resources for this. Thanks Joel. Hopefully this is something in the works for the future. I can't find any information on how to access or install this add-on. Where can it be found? I'm using the professional trial, and i cannot find the costumer lists option. Hi Carlos and David - The customer lists feature is an add-on to the professional and enterprise plans, meaning you need to purchase it in addition to the plan. You can do so by reaching out to your sales representative for more information. If you do not have one you've been working with, let me know and I can connect you to someone who can help set that up for you. Hi Nicole. I'd like to know more about the customer list feature. Can you connect me with a sales rep who can tell me more ? Thanks! Hey Laura - I've pinged the appropriate person on the sales team; you can look for an email from her soon. In the meantime, feel free to let us know if you have any additional questions! How do we create a list of customers who had a ticket within last 3 months (or any specific date range)? You'd need to create some kind of custom field that identifies these users. I'm not sure what that would look like, but a custom field is the only way to get additional customer attributes to filter with. We would like to create a customer list that selects users who have a ticket marked as closed in the last 30 days to use with the NPS Survey. We use an automation to close the tickets 5 days after they have been marked as solved. We thought about adding a tag ("NPS_eligible" or something like that) when this automation fires but we are unsure how to clear this tag once the customer list is used for that period's NPS survey. We can potentially add a custom field for this, rather than a tag, but we're again unsure how to reset/clear this so the user only receives the NPS survey after they have a ticket marked as closed within the last 30 days. I'm creating a ticket for us, because we'd need to discuss the Automations in your account. You'll receive an email from me shortly. Is there plans for filters to be more expansive? Currently we can't use something like "is not" or have filters meet an "any" condition like (kind of like triggers). I feel the lists in their current state are very limiting. There are no immediate plans for any new functionality around filters. However, I encourage you to post your thoughts in the Product Feedback topic where the Product Managers can see it. I created a customer list adding e-mail as a column. That happens when the users in question don't have email addresses associated with their profiles. This happens when user profiles are created via phone call or social media channel. All the customer listed was created manually. On "Sciannamè Maurizio" you can see the e-mail address but NOT for "Max utente finale"
Hm...I haven't seen something like this before. Maybe it has something to do with whether the user's email address is verified or not?